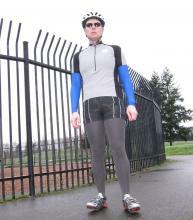 Found on the web, seattlespandex and his excellent cycling outfits. The comments are his. The fleece tights are almost completely opaque by themselves. However, I'm wearing them over a couple of pairs of opaque black tights as well, for extra warmth and snugness...Shorts are actually a women's trisuit worn under my cycling jersey....I love the shine of the spandex Zoot trisuit!..The blue sleeves are a men's under armour spandex heat gear shirt. Wearing women's UA long sleeve shirt under a women's sleeveless cycling jersey over a women's Zoot triathlon suit, over women's Nike leggings, over women's footed tights...I'm 5'11" but wearing women's size XS leggings for the extra stretch and size. These leggings are long enough and stretchy enough to pull it off. Actually they fit perfectly. I love riding in women's footed tights, always get lots of looks!..The shiny Merona tights are worn over 2 additional pairs of tights, for a completely opaque look..worn under a Brook's lycra track suit (super short-shorts), and under armour spandex shirt under the red cycling jersey...The short-shorts of the track suit creep up even further when on the bike, exposing my tights even further! On this ride I wore thin grey footed tights (from Walmart) over 2 pairs of thicker black footed tights, for a completely opaque look. The spandex shorts are actually a one-piece track suite from Brooks, so it's like a leotard with shorts. The long sleeve shirt is a purple UA women's cold gear shirt...Worn over black tights, you can see the darker areas where the grey tights are stretched a little thin. I'm wearing a women's Zoot tri suit over a pair of super-thin women's ISIS base layer leggings, over 2 pairs of footed tights. The shirt is a blue UA Metal Gear shirt under my tri suit and cycling jersey. Take a close look - no seams! These are womens footless tights worn out in public on ...a rare sunny day in December: Womens gray footed tights Womens black footless tights Womens gray spandex shirt Womens cannondale cycling jerseyWomens black spandex tri suit...Got lots of looks! My out-of-control obsssion. When this photo was taken, I had 1400 pairs of tights (less than half are shown here). Can't say that this outfit will attract much attention here in NL. The gray tights are a bit unusual, because it's usually expected to wear more distinct colours. And nobody can see (and nobody cares) if it's leggings or tights. I think I may retire to NL, anywhere you recommend? So many tights - is that Siberia winter gear? I agree, if you love tights, you can wear them on a bike without attracting any attention and probably stack a lot of them before your legs get stiff. But for real cycling, I wouldn't wear anything that suppresses blood circulation or compresses my belly (and several pairs of tights do that effectively). 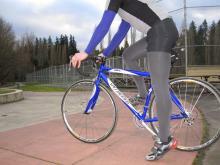 But, what really worries me, is the huge number of layers between saddle, legs and crotch. Isn't that horribly uncomfortable? Well, tights aren't a fetish of mine, so don't take my post too seriously. 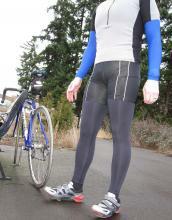 My biking legwear for the upcoming spring consists of padded biking pants and a flattering lycra wraparound skirt. Trade-offs and compromises. Jogging, cycling, cross-country skiing, diving are just obvious examples where you can where almost everything (OK, at least within my fetish preferences) you want without "being noticed". The level of comfort does vary, but if you do not push your limits, do not train for national championships, wearing "not dedicated clothes" is OK. I said many times that I train in a neoprene suit with pantyhose on my legs and arms. How is it suitable for jogging and martial arts? Perfectly! At least the elasticity of rubber and nylon+lycra is much better than of traditional cotton. 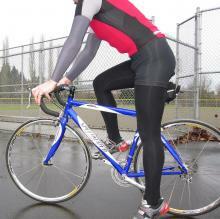 Compression is good (additional training and muscle/veins support) but the tight clothes should not cut the blood flow. Overheating is another problem to avoid.